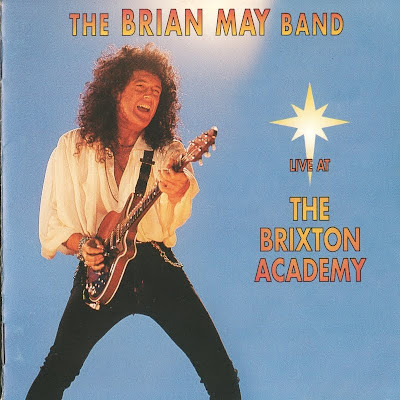 Live at the Brixton Academy is a recording of The Brian May Band's first show in London on June 15, 1993. The album was released on CD, LP and VHS in 1994, and remains the group's only release as a collective. The album is an almost complete and unedited version of the concert. Their performance of John Lennon's God (The Dream Is Over) was not included on the album due to copyright issues. Keyboard player Spike Edney had to play a second solo (neither are on the CD, the first being on the video) after May had technical problems before playing Last Horizon. Also, Back To The Light, Tie Your Mother Down, Love Token, Headlong, Let Your Heart Rule Your Head, Resurrection (in particular, Cozy Powell's drum solo), We Will Rock You and Hammer To Fall are all slightly shortened on the CD, but appear in full on the 90-minute video of the same event. The show includes live renditions of the top ten singles Driven By You and Too Much Love Will Kill You.